Within a few years of the Wright Brothers’ first flight, dozens of inventors and companies developed their own aircraft designs. It was an era of exciting progress and crazy experimentation. Many of the aircraft types that emerged in these pioneer days of aviation look like bizarre death traps that shouldn’t even have flown. Yet hundreds of pilots, enamored by the novelty of conquering the skies, took to the clouds in these under-powered, rickety planes held together by wood, canvas and a prayer. 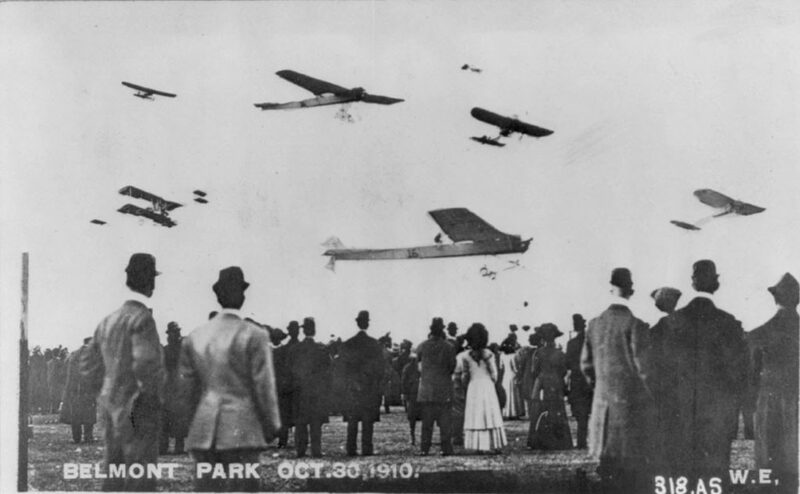 In this picture, a group of well dressed men and women have gathered in Belmont Park on October 30, 1910 to watch an early airshow. A hodgepodge of aircraft of all shapes and sizes are flying overhead, in what appears to be a chaotic, too close formation. It is interesting to note the different types of planes in this one picture: there are bi-planes and single winged (monoplanes) aircraft. A blow up of the plane in the center shows that the pilot flying the aircraft does not have a proper cockpit or even a chair. He seems to be precariously perched on top of the fuselage of the plane. Note also the primitive landing gear. This is an interesting photograph of the Airship Akron, just before its departure and shortly before its fatal crash. 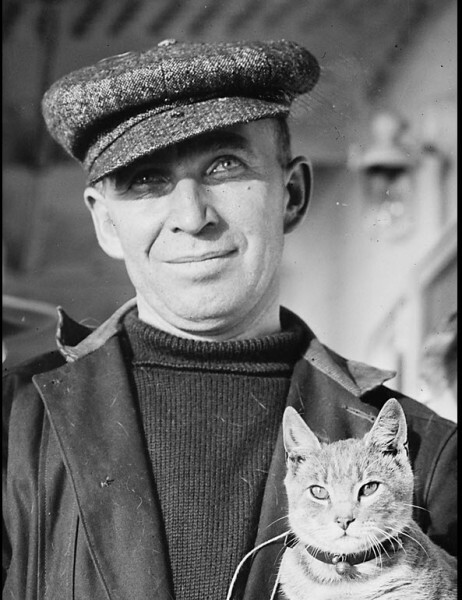 The Akron was a dirgible built by pioneering American photographer, inventor, adventurer and early aviator Chester Melvin Vaniman (1866-1912). Vaniman built the Akron in an effort to be the first to cross the Atlantic in a dirigible. But on its first attempt the Akron exploded on July 2, 1912, the Akron exploded just off the shore of New Jersey, killing Vaniman and his crew. 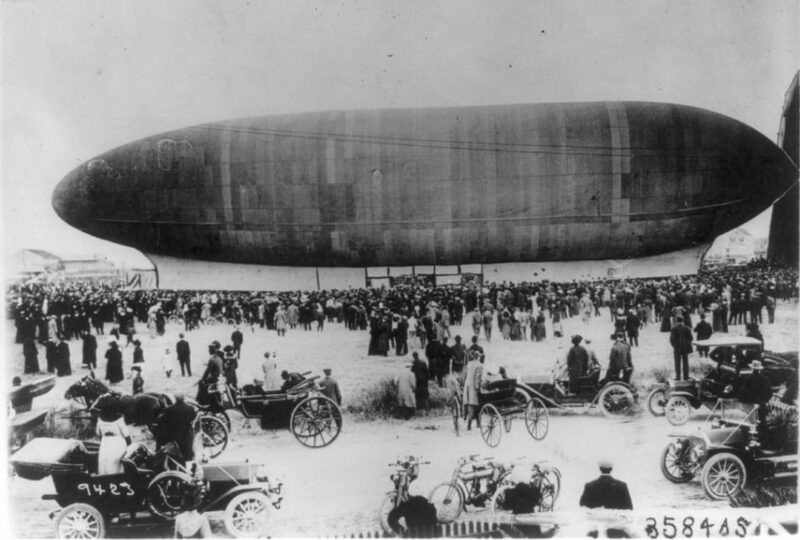 The picture is interesting, not only because it records some of the final hours of the doomed airship but also because of the crowds that came to see it off. We see an interesting cross section of an America in transition: horse drawn carriages mingle with parked cars and motorcycles, while a giant airship – which would prove to be an evolutionary dead end in terms of aviation – looms in the foreground.